Verona NY…Turning Stone…has made some very nice changes. If you did not go with us in 2014 then when you go this time you will get a new players card. Your card number will be the same and any credits or benefits you had on the old card will be on the new card. You can play with cash. Your free play is really free and can be cashed out. You can cash out anytime for the full amount on your card. 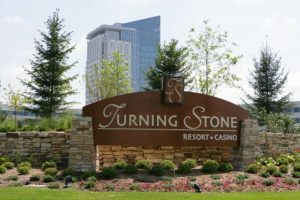 When we arrive at the Turning Stone Casino, you will get your two day package, and room keys. At Turning Stone we stay right in the casino. Please choose (ASAP) whether you want the Bingo or Slots package. We are no longer able to split the package. Bingo Day One, $30 Bingo Bucks w/$10 Bingo Match Play, and $20 Bingo Bucks for the second day. Slots, Day One, $40 SD, and $25 Slots for the second day. You will get a $20 meal coupon for each day. You will be on your own for the duration of the stay. Since we are staying right at the casino you will not see the bus until its time to leave Tuesday at 4 pm. Please let us know ASAP which package, Slots or Bingo, you want for Turning Stone. With the changes we have made your total package for this tour will be $95 SD and $45 in food. This makes it one of the best overnights yet! Lancaster PA – Skyline Pool at 8 am, rt about 9:45 pm.